It is one of my favorite days of the year! 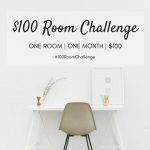 It’s REVEAL DAY for the $100 Room Challenge! 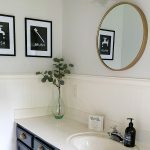 If you are new to this challenge, the concept is simple: you get one month, and $100, to transform one space in your home. Make sure to check out all the amazing room reveals using the links at the bottom of this post. I promise, you won’t be disappointed. Admittedly, this room reveal doesn’t quite have the “shocking” before and afters that you’ve seen in the past. 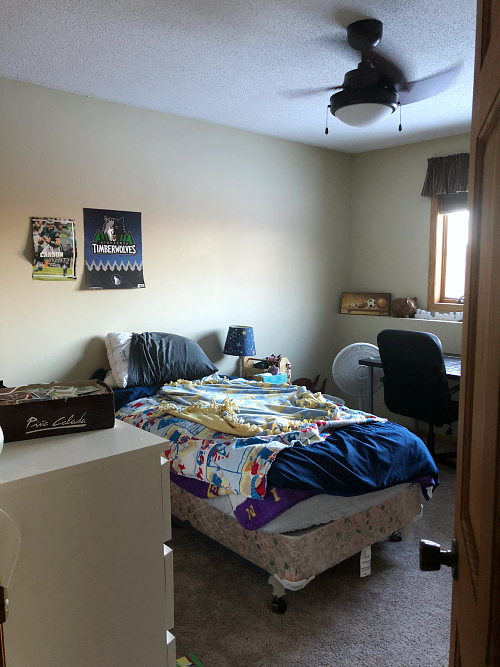 (If you want to see a major change, check out our last $100 Room Challenge reveal done for $99!) Truth is, sometimes you just need a refresh and a little organization. So, let’s talk about what we did in here by taking a look back at the goals from week 1. I could not be happier with how well this project turned out! I hoard bins and baskets, so I grabbed one from my stash to hold all the bullets and accessories. The other side of the shelving unit will be for all the hats my son will be acquiring over the next few years. If you missed last week’s post, our family decided we were going to visit all 50 states before my daughter graduates from college (seven down, forty-three to go). 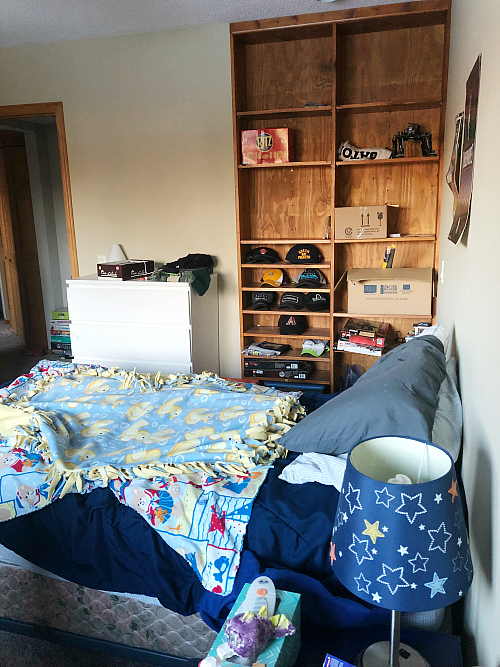 In each state, my son gets a hat as a souvenir, so this shelving area is a perfect way to display them. Like Nerf bullets, Legos are everywhere; and without a designated place to put them, they end up on every surface in our home. I decided to grab 2 plastic drawer units we have had for years. A little spray paint to liven them up, and we had Lego storage. I know there are some that go all out and sort by color or shape, but seriously, while that may look great for pictures, there is no way that’s lasting for more than 2.3 seconds, so we didn’t waste our time. 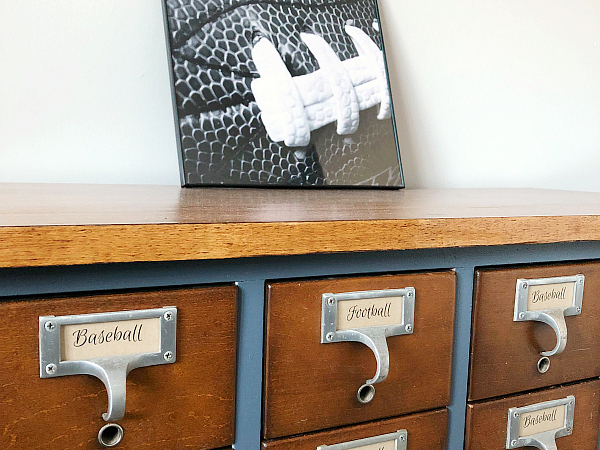 This is one of my favorite projects of all time, and I discussed the process of making this card catalog storage in week 2 and week 3. 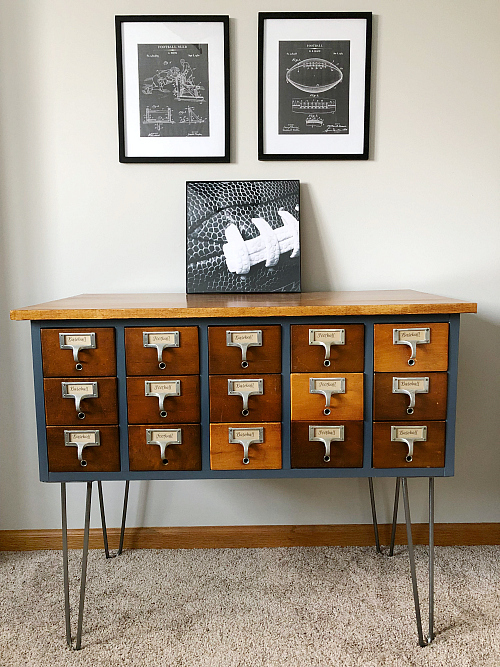 The gist: we took an old card catalog my dad gifted me for Christmas a few years ago, and gave it some paint, new hairpin legs, and a wooden top. 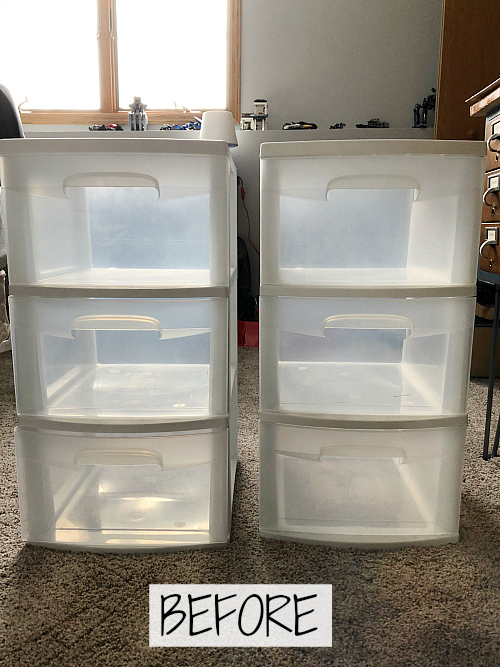 With the millions (okay… thousands) of baseball and football cards my son has, this was the perfect way to store them! 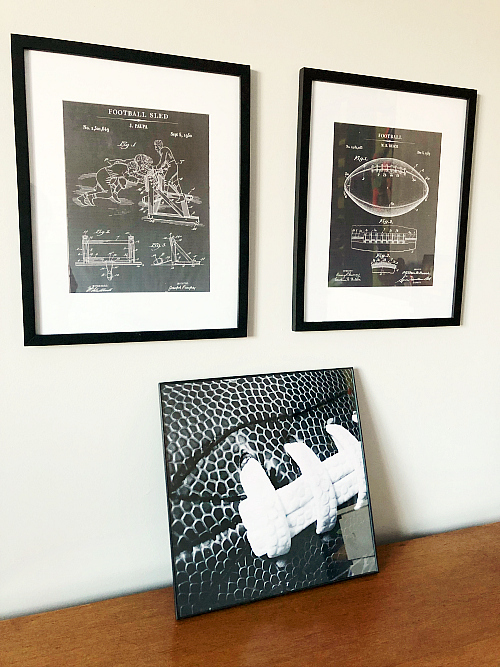 I also found a few printables to hang above the card catalog, and then grabbed a framed black and white photo of a football I had taken a few years back. You can find more information in week 3. This was a questionable project on our list. 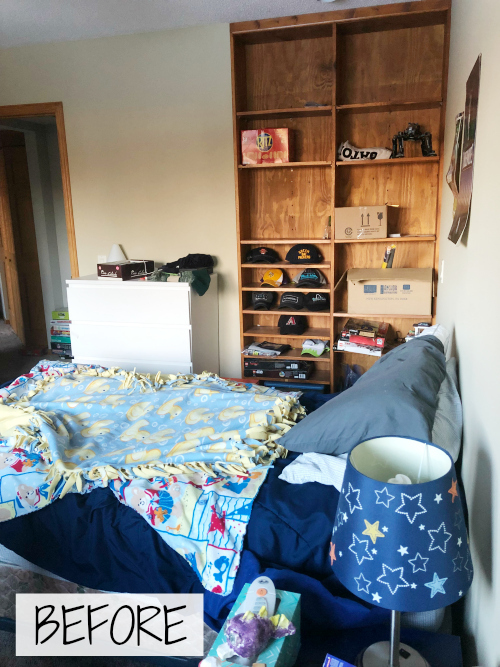 I didn’t know if time and budget would allow for a dresser makeover, and unfortunately, time was not on our side. I still have some money leftover in the budget, so maybe we’ll get to this a little later. 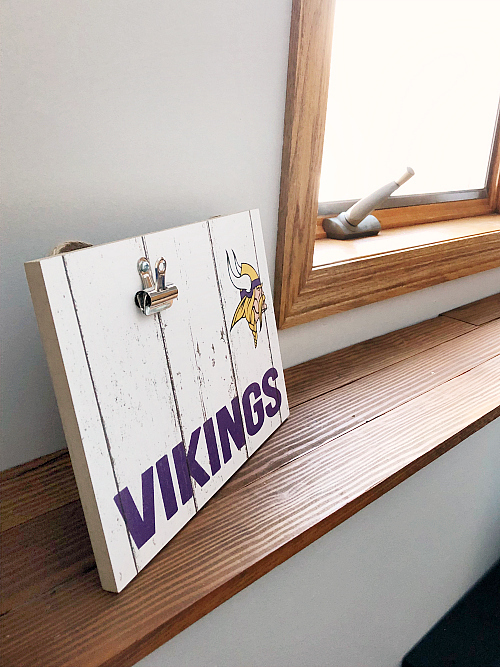 However, we did do something that wasn’t on our list… This room has a ledge that is made out of drywall (I feel like this is a common thing in homes), but both my husband and I thought it would look better if we added wood to the top to create a little warmth and texture, so my hubby grabbed some old barn wood we had out in the garage; cut it, sanded it, stained it, and nailed it onto the top. This room may not have been the worst color in the world, but the beige-yellow wasn’t great. 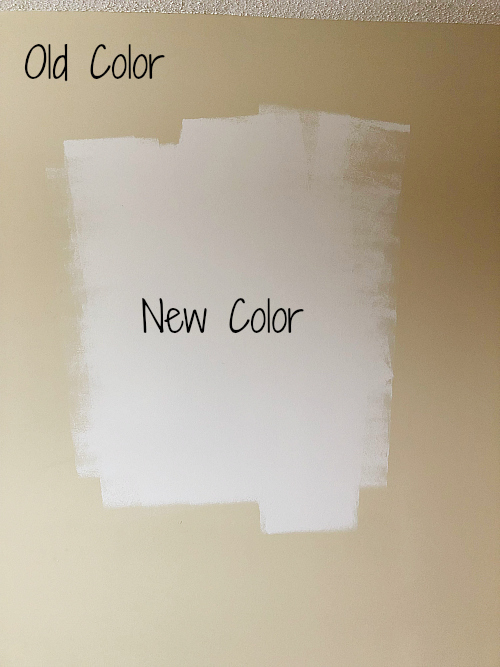 We decided to paint everything a light gray (Stonington Gray by Benjamin Moore, color matched in Behr to save money), and I absolutely love it! The pictures truly don’t show how crazy different this change was, so here’s a shot that shows the true difference. We also bought some poster frames (which were super cheap, so it took quite a battle with packing tape to make them work). Got those up on the wall, and we were done. Ready for some “Before & Afters”? Be sure you check out what all the other participants did with their $100 using the links below the Pinterest image! You can also follow the hashtag #100roomchallenge on Instagram for more amazing inspiration. What a difference! 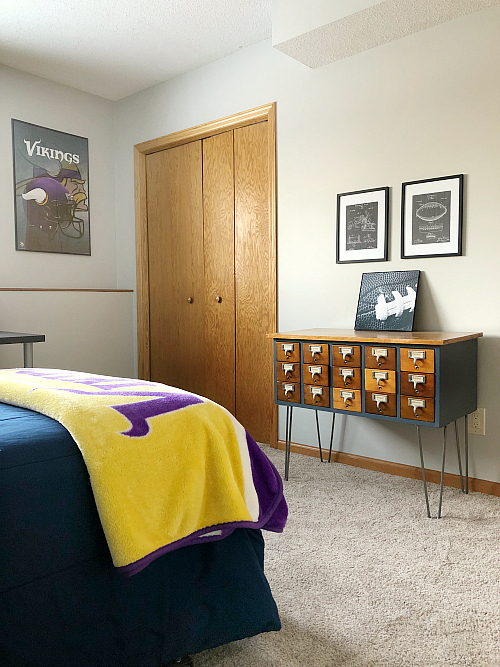 My favorite project is the baseball card storage – it turned out amazing. 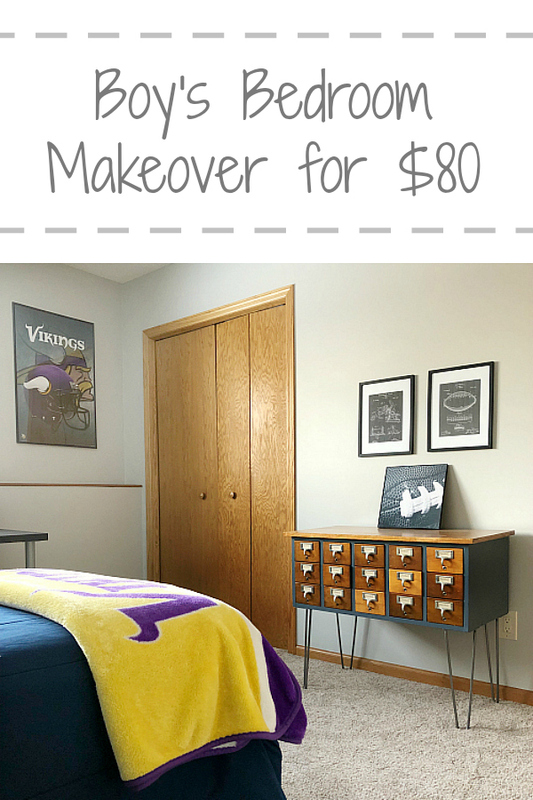 I love all the storage ideas you created for your son’s room and the paint color change. Erin, wonderful transformation! I love all the great storage solutions you came up with especially the baseball/football card organizer! Also, my son is practically green with envy over that nerf wall, it’s so awesome. We might try to fo something like this for my son in the garage. Thank you again for hosting this awesome challenge. Because without it I know for a fact my daughter’s room would still be a hot mess right now LOL. This room just proves what a wonder paint can be! Love the bookcase makeover, the new wall color, and of course the card catalog. 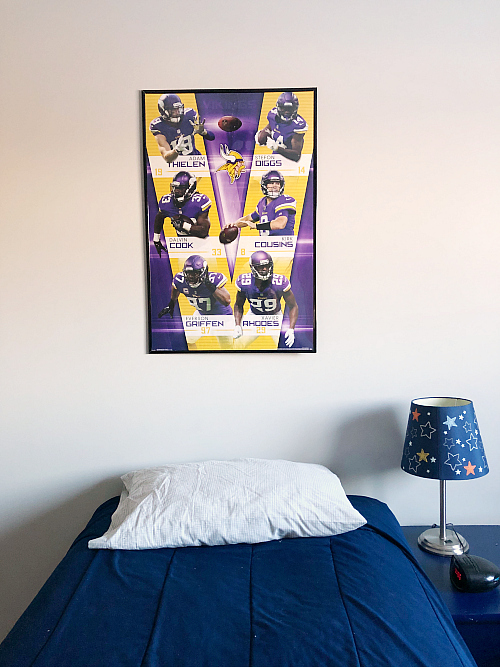 Those football engineer prints are a fave of mine as well- what a great idea! Thanks again for hosting Erin! I really love this challenge and am already thinking about the fall. 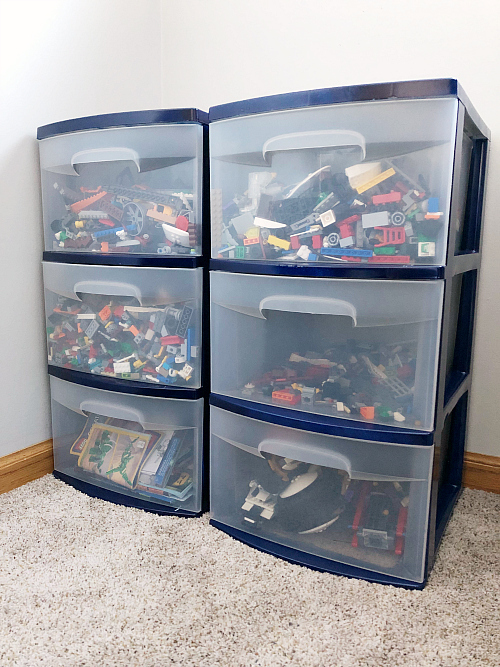 I am loving all of the smart organization you used in this room! 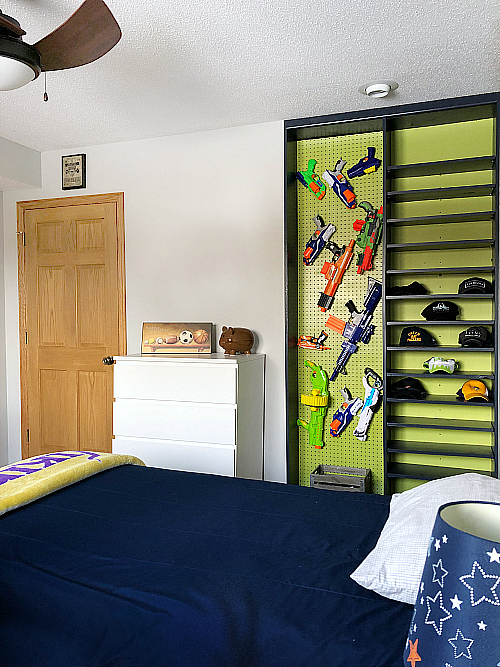 That nerf gun storage= brilliant! Plus the card catalog for the cards is just so smart. 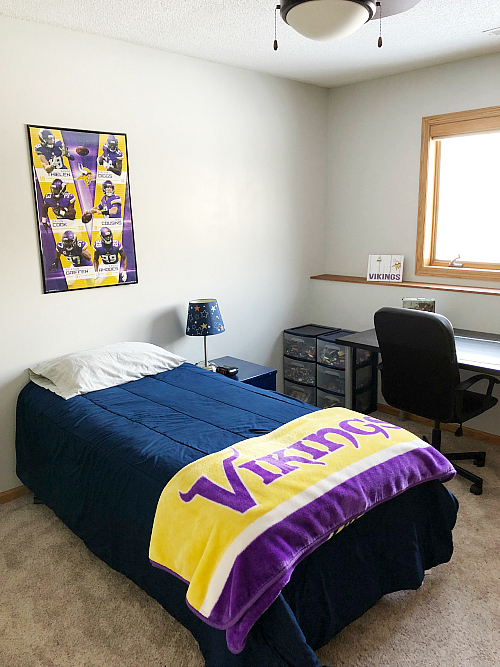 I know your son is loving this space! 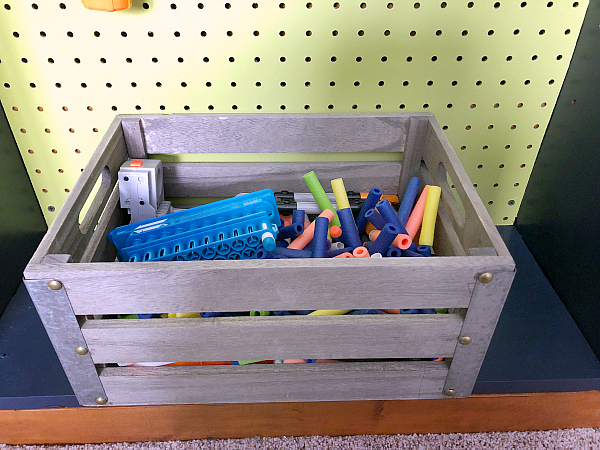 I LOVE the pegboard storage for the Nerf guns!! So cute! Wonderful job, Erin! gah, your projects never cease to amaze me with what you can do and ALWAYS under budget!! LOVE IT! The card catalog is genius for the baseball cards! And that nerf wall, you know his friends are going to be envious! It all turned out so well. Boy, I bet your other two children are so jealous right now! Great job! I love the card catalog project you did the most! Love it! My absolute favorite item is the card catalog! 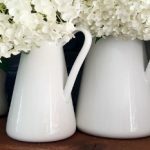 I would love to find one of those to use in my home! Great job! The cap display shelf is also a great idea! What a great way to display their hats. I wish I had thought of that when my son was younger. I love everything that you have done in this room. It’s a perfect boy room! It really turned out great!!! LOVE the nerf gun wall!! 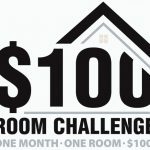 Cheers to another successful $100 Room Challenge! THANK YOU for hosting! Erin you little guys has got to be loving his new space! I still think the baseball card catalog is my favorite piece in the room, but it all looks great. Thank you again for being our fearless leader and organizing such a wonderful challenge. I’m so glad I’m not the only one who works around things in the room! It look AWESOME!! I came in $20 under budget too and it FEELS. SO. GOOD. Great job per the usual! 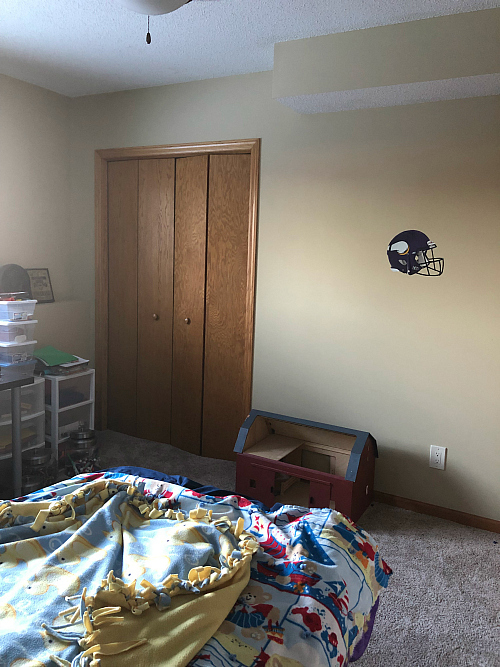 Erin, your son’s room looks awesome! 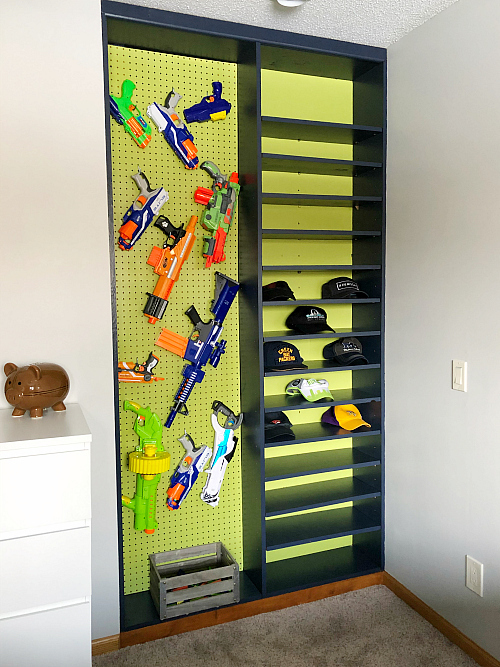 I LOVE that card catalog project you did, and the nurf gun wall is perfect for organization. I love that he’s collecting hats, too, from all the states. GO MARYLAND! 🙂 Such a fun way to display them. 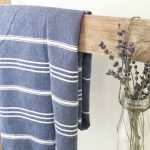 I loved following along this month with all the fun & thrifty projects, and participating too! Thanks for hosting this awesome challenge! Great reveal Erin. 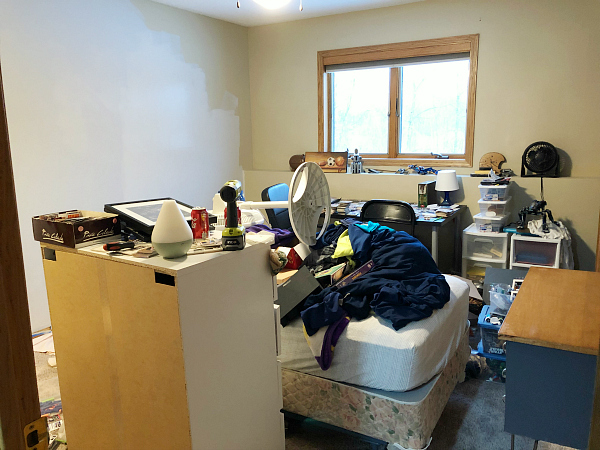 Your son’s room is so neat clean and cool looking now. I absolutely love that card catalog makeover. It ‘s like a big statement piece in the room. Also, thanks for hosting this event. 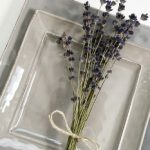 It’s a great way for me to push myself and update parts of the house within a very doable budget.